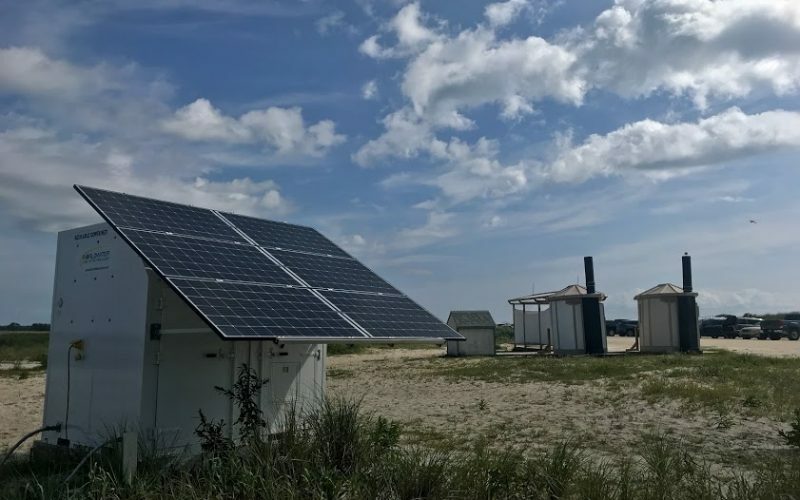 World Water Solar | Gonneville Inc.
WorldWater develops, designs and builds integrated solar platforms to provide water and power. We have ongoing global success with off-grid and stand-alone solar infrastructure to pump, purify and desalinate water. 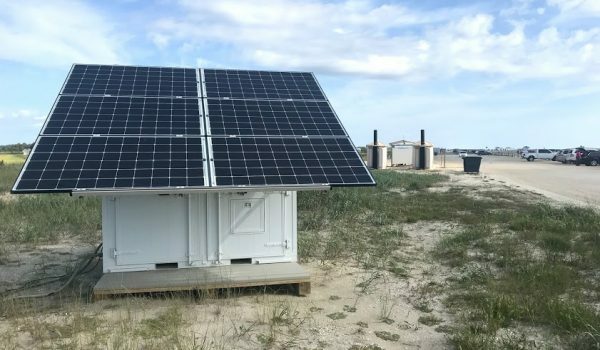 Stand-alone solar infrastructure that delivers clean water & reliable power where traditional sources are unavailable, compromised, too expensive or environmentally unfriendly. 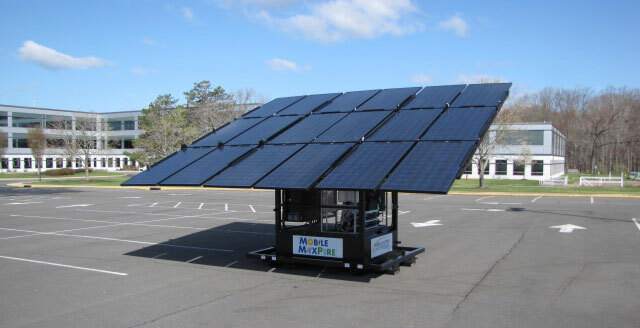 The MMP (Mobile MaxPure) is a mobile, self-powered, off-grid system that does not require a connection to the electric grid nor a constant supply of diesel fuel. 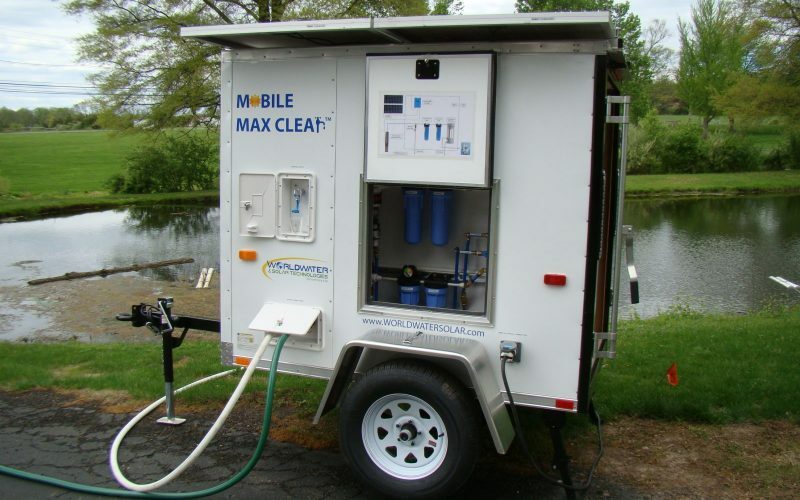 The Mobile MaxPure™ (MMP) Freshwater System pumps and purifies an average of 30,000 gallons (113,500 liters) each day at a cost of less than one (1) penny per gallon. This calculation includes capital costs and all consumables over the course of the first year. After the first year, the cost reduces to fractions of a penny per gallon because the capital outlay has been paid off. 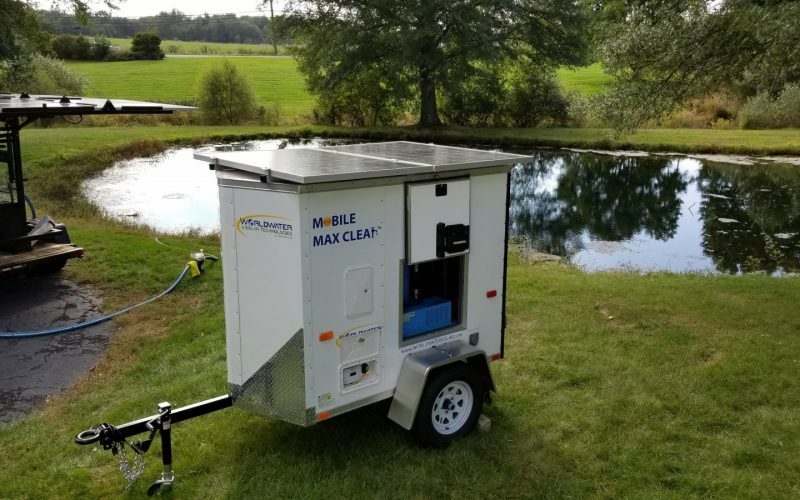 The Mobile MaxPure™ (MMP) Brackish Water System pumps and purifies an average of 4,000 gallons (15,150 liters) each day at a cost of approximately two (2) pennies per gallon. This calculation includes capital costs and all consumables over the course of the first year. The MMP Brackish Water can handle up to 32,000 parts per million of total dissolved solids, biological and sediment contaminated brackish water sources. The Mobile MaxPure™ (MMP) Seawater System pumps and purifies an average of 3,000 gallons (11,350 liters) each day at a cost of approximately three (3) pennies per gallon. This calculation includes capital costs and all consumables over the course of the first year. The MMP Seawater can handle up to 45,000 parts per million of total dissolved solids, biological and sediment contaminated brackish water sources. Each Mobile MaxPure™ comes standard with a Field Support Package (FSP). 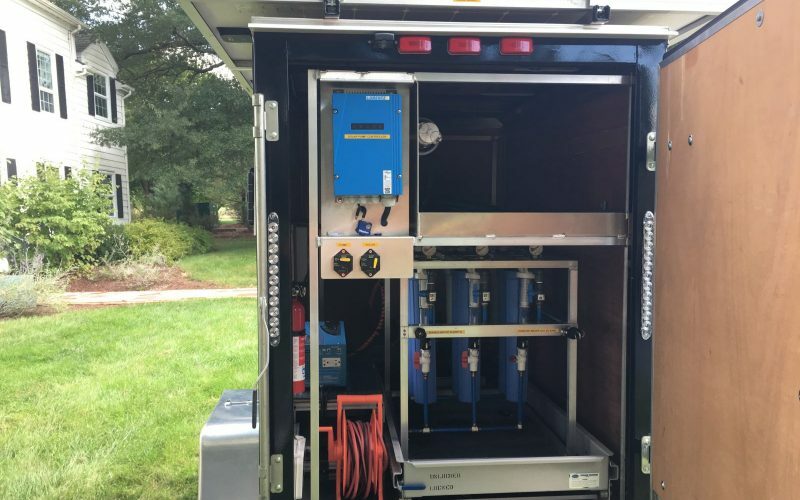 The FSP comes with a variety of tools and components necessary to operate the Mobile MaxPure™ and associated purification systems. The FSP is packed into a custom-built, powder coated steel toolbox that is transported with each Mobile MaxPure™. The unit also provides power to run lights, tools, equipment and sensitive computers and other electronic equipment. Inverter systems for use with US or European specifications are available. Optional satellite communication systems and a custom trailer are also available. The MMP fits easily into standard international shipping containers; four (4) fit into a standard 40-foot container. There are lift points built on to the sturdy frame to airlift the unit by helicopter. It can also be transported by truck or boat. The MMP is powder coated to reduce rust and all components are marine grade and sealed against the elements. The MMPs have provided water and power under severe conditions. 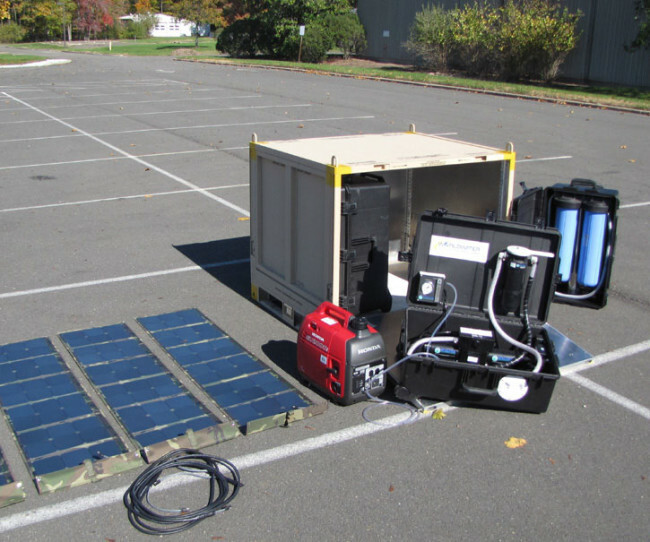 Mobile MaxClear™ is a solar-powered, stand-alone system designed to pump, filter and purify water. 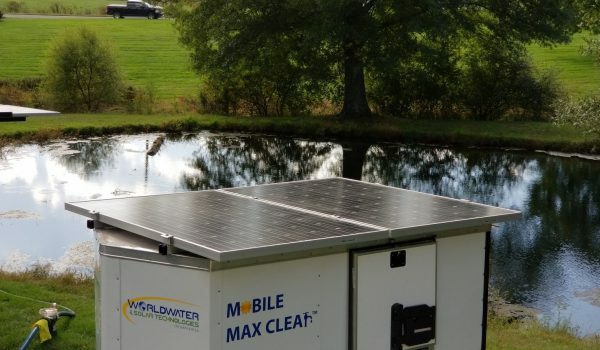 The system is mounted on a custom trailer platform for ease of mobility and utilizes WorldWater’s proprietary technology to provide clean drinking water anywhere in the world. To help ease logistics and enable transport of these solutions, as well as other equipment in the field, it has developed a trailer specifically designed to transport ISU Containers and 463L pallets. 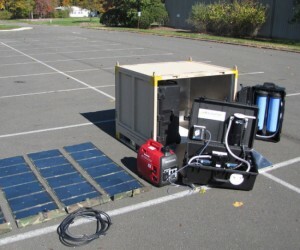 SHEPS™ (Solar-Hybrid Electrification & Purification System) is a solar-powered, stand-alone and easy to use system designed to pump, filter, purify and desalinate water, as well as provide renewable power. The system utilizes proprietary and patented technologies. *Assumes 5 peak-equivalent solar hours; fewer solar hours will result in decreased operating time and output. Auxiliary generator and vehicle power input is built in to extend operation as needed. Construction Various Materials Equipment is housed in shock-proof ruggedized plastic cases. All water equipment is corrosion resistant plastic or stainless steel. Construction Various Materials Equipment is housed in shock-proof ruggedized plastic cases. 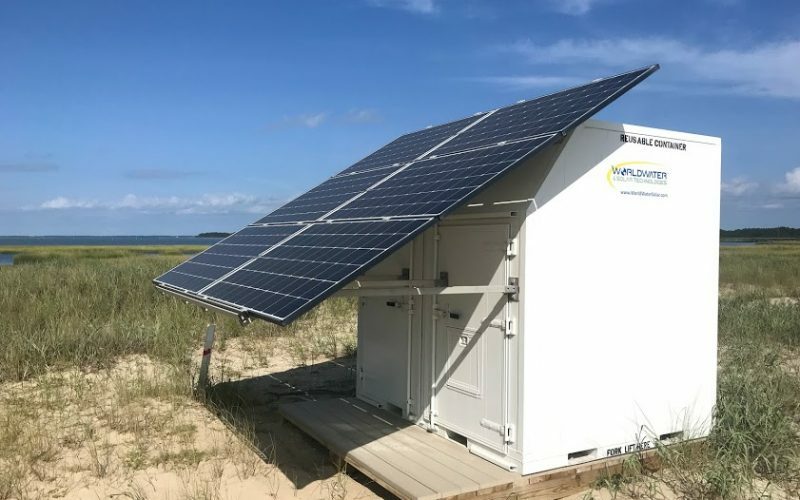 The Solar Pumping Station™ is built into an aluminum ruggedized container with an integrated photovoltaic system, pump controller, batteries and accessories for a complete and operable pressurized water pumping system to provide off-grid pressurized water service for showers, wash stations, irrigation, etc. This self-contained, self-powered unit provides a scalable, system-based solution to the provision of clean pressurized water in remote sites and areas requiring easy redeployment. The SPS has flexible power solutions that meet a wide range of project scopes and needs. 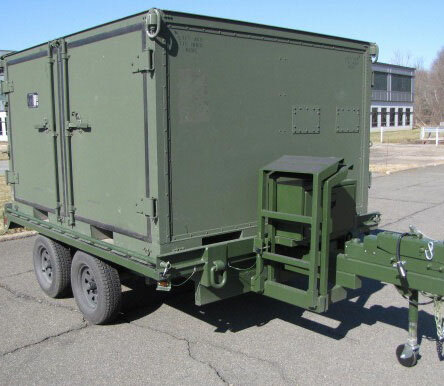 MiDAS™ (Miniature Deployable Assistance System) components can be used separately or as part of a system-of-systems designed to be deployed quickly to austere environments where essential services are not immediately available. Water filtration and purification equipment with the capability to produce potable water from freshwater, brackish water and seawater. Reliable, hybrid power for primary MiDAS services (water purification and communications) capable of operating independently or as an integrated kit. Access to commercial imagery and locational data on aid personnel, images and voice tracks for time-critical situational awareness and mission planning. Information sharing on threats and/or status (e.g., recovery efforts, local populace, services, environment and infrastructure). The Joint Modular Intermodal Container is a U.S. Military approved light-weight container that provides easy access to container contents, uniform in size, easy to transfer and collapses to reduce space requirements when not in use. 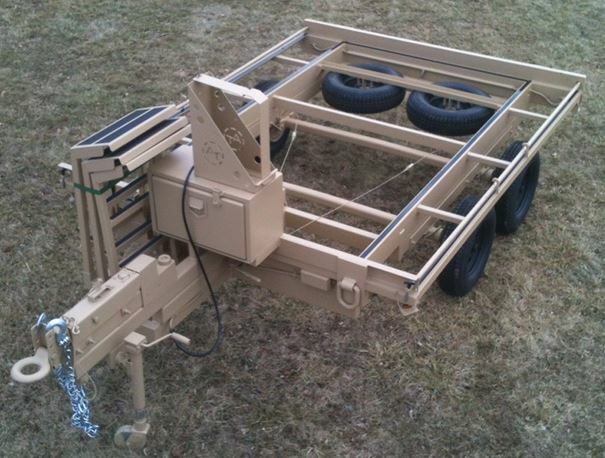 Each component is contained within transportable cases and may be transported in a civilian Sports Utility Vehicle (SUV) or military type HUMVEE. Modularity of the system enables only the components required for the mission to be removed from the container. MiDAS™ is an affordable, self-contained, modular, hybrid-powered system providing portable water purification, communications and situational awareness capabilities. 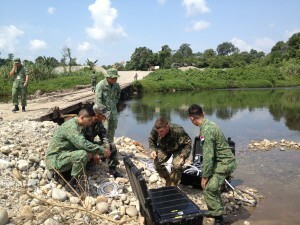 It provides services to small military teams or local responders in support of a wide variety of missions including humanitarian assistance/disaster relief (HA/DR) and operations in remote areas. Operating Dimensions Open Area for deployment of solar array, water purification, communications and container is 400 ft.
Transport Dimensions Closed JMIC Intermodal Container: 43.75 inches long, 52 inches wide, 43.25 inches high (1.1 meters long, 1.3 meters wide, 1.1 meters high). WorldWater designs and manufactures a wide range of stand-alone solar infrastructure for defense, security and disaster relief missions. 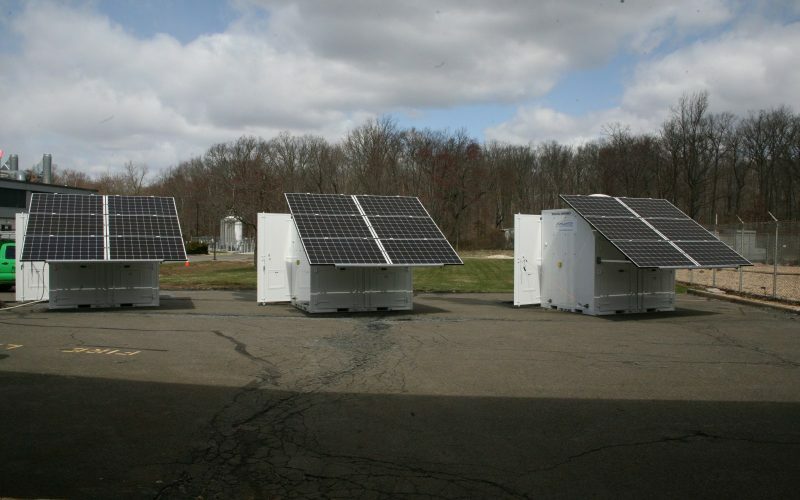 Its fully packaged, portable and transportable solutions provide onsite power, water purification and communications. Ability to transport any ISU container with a total packed weight of 5,400 lbs. (2,449 kg). Lighting LED Lighting is 12/24 VDC compatible. Comes with spare tire & locking. 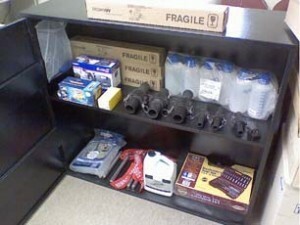 Tools Integrated Tool Box. Support kit contains: jack, wrench, chocks and winch handle and strap. Cargo deck access steps included as standard equipment.